Cooktops have become a common feature in many homes. These compact stovetops are often installed on kitchen island countertops that serve as the central point for food preparation and entertaining. 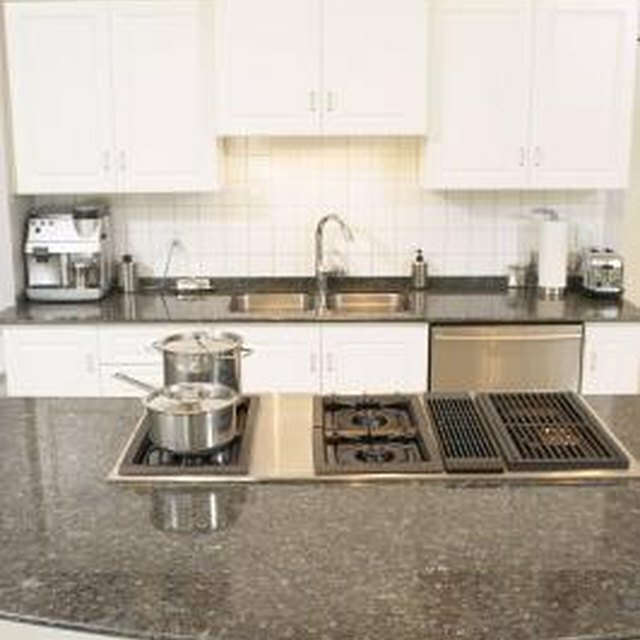 Cooktops, like other ranges, require venting to remove smoke and odors from the preparation area. Overhead venting systems are often used, but these may create a visual obstruction around the cooktop area. Homeowners can also install a downdraft vent near the cooktop that pulls the smoke away and into a duct system that draws it to the outside. A downdraft vent helps to remove cooktop smoke and odors. Disconnect the electrical power to the cooktop island. Determine where the downdraft vent should be located in relation to other equipment on the countertop. These items may include the cooktop, sink, working counterspace and other materials that require clearance distances from each other. This information is generally included in your owner’s manuals for these items. Measure the required opening for the vent in your countertop. Mark these dimensions with a pencil. Use the power saw to cut the opening into the countertop for the installation of the vent. The vent must be installed in a vertical orientation, not slanted or angled in any way. Secure the vent to the countertop surface with the fasteners that were included with the vent. Attach the undercounter mounting bracket with screws to the upper right corner of the vent with the slot over the hole and the flange against the countertop. Attach the other bracket to left side similarly. Drill starter holes through the undercounter brackets into the underside of the counter. Insert the screws and tighten securely. Ensure that the blower has full clearance beneath the countertop and extend the support legs to the bottom of the cabinet. Run electricity to the cooktop island through the conduit to the vent box after removing the knockout opening. Connect the electrical wiring to the drowndraft vent with wire nuts as directed in the owner’s manual, taking care to secure excess wiring to the side portion of the cabinet interior. Generally, the white wire is connected to the white wire on the unit, and the black wire is connected to the black wire. The ground wire is the attached to the eyelet and secured. Measure and cut a hole in the floor with a saw to fit the ductwork from the downdraft vent. Attach the duct to the vent with screws supplied by the manufacturer. Fit ducting through the floor, securing the ducts to the joists with straps. Clamp sections of the ductwork together to reach the exterior wall opening, using vent clamps. For the best function of the vent, the ductwork should follow the straightest and shortest route possible to the outdoors. Use metal ductwork only. Generally a 3 1/4-inch duct is used. This size can be transitioned to 6-inch duct if necessary. Secure ductwork to the joints in the floor or walls with strapping and nails. Measure the duct and cut a hole in an exterior wall to vent the exhaust with a wood or masonry saw as required. Remove dust and debris from the hole surface. Set the vent cap into place and attach it to the vent with sheet metal screws, then attach it to the exterior wall with wood or masonry screws. Ensure that the damper on the outside of the cap is positioned to cover the cap effectively. Caulk around the edges of the cap. Turn on the electricity to the cooktop island and test the exhaust vent system. Use round ductwork rather than rectangular, especially when elbows are used. This type of ductwork provides better function for the venting system. Some downdraft vents are designed to rise above the cooktop surfaces to pull smoke from the air. Ensure that raised parts do not obstruct any materials on the counter surface. Ensure that the vent exhaust is carried to the outside of the house. Smoke and odors should not be vented to the basement, crawlspace or within walls. Do Bathrooms Need an AC Vent?